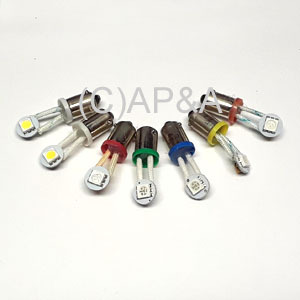 Flexible-lead LEDs in a variety of colors. #44/#47 style with metal bayonet (twist-in) base. 6-volt, AC or DC. Flex LEDs have 2 flexible wire leads that allow you to bend, twist, and position light in any direction you need it. They work best under playfield inserts that use horizontally-mounted light sockets, allowing you to turn and position the LED directly up through the playfield insert after installing the bulb in the socket. NOTE FOR BALLY AND STERN GAMES 1977-1985: May not work correctly in all feature lamp circuits on early Bally and Stern electronic solid-state (SS) games. LEDs may exhibit some flickering when used in these games. Aftermarket LED lamp driver board may be required for proper operation. Ghosting is a symptom that some LEDs may occasionally exhibit when used in certain places in some electronic pinball games. It is the partial-illumination of an LED bulb, when it is supposed to be completely off. For example, if a games 1000 bonus LED is lit, another LED elsewhere on the playfield that is supposed to be off, may glow dim at the same time. This is caused by electronic characteristics of some types of LED bulbs and the unique matrix-style wiring/switching used in some pinball games. It is a purely cosmetic symptom and will not cause damage to your game. Ghosting is sometimes noticeable, and sometimes not- it all depends on the type of LED, color, visibility, and where it is located in the game. If you do have any LEDs that are ghosting, and prefer to eliminate the effect, you can use a non-ghosting type of LED in place of the problem LED.